In March in my ABA Journal column, I reviewed PacerPro, a free service for searching the federal courts’ Public Access to Court Electronic Records (PACER) system. Inforuptcy is a similar sort of service, except that, whereas PacerPro searches only district court dockets and excludes bankruptcy courts, Inforuptcy does just the opposite, searching only bankruptcy courts and excluding district courts. That, however, is about to change. 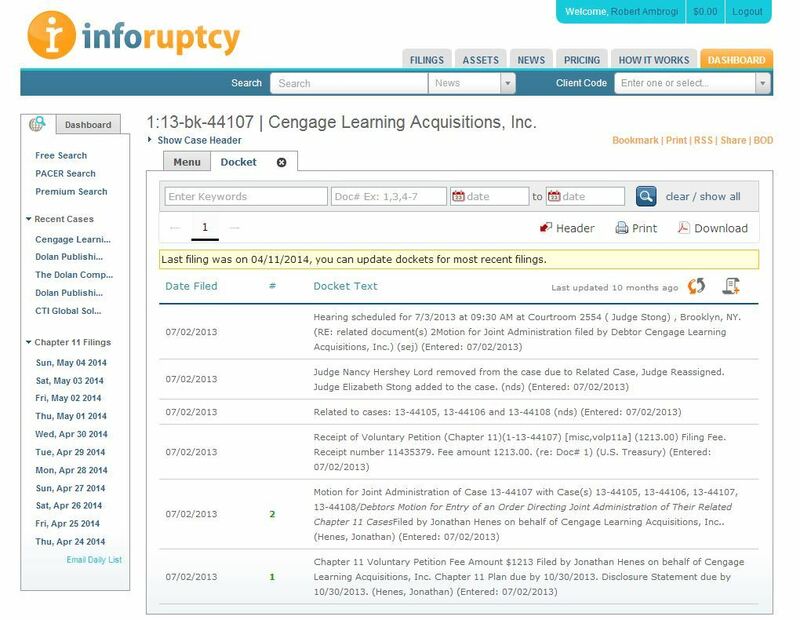 Later this year, Inforuptcy will be expanding to add district court dockets. Read on for more information about this. First launched in beta two years ago, Inforuptcy is a service designed for anyone who is regularly involved in bankruptcy matters, including lawyers, creditors, debtors and investors. In addition to providing enhanced access to PACER bankruptcy dockets, it also tracks bankruptcy filings and news, hosts a marketplace for buying and selling bankruptcy assets, and provides a platform for managing electronic case filing (ECF) emails. Now, Inforuptcy is unveiling its plan to expand to include all federal district court dockets available on PACER. The expanded offering is slated to become available in September 2014. Inforuptcy is offering “exclusive, early access” to its expanded site to law firms that pre-order now and purchase three months of access at a discounted rate of one-third the full price. The expanded service will include the same features that it now provides for bankruptcy dockets, including an enhanced PACER interface and case folders for storing dockets and documents. Inforuptcy provides a search interface to PACER. Basic docket searching on Inforuptcy is free — you do not even need to log in or create an account. You can search by case number, case title or party name. Whenever a user retrieves a docket or a document from PACER, Inforuptcy keeps a copy in its own database. When you conduct a free search, Inforuptcy first searches its own database and, if it already has that docket, it shows the stored version. If it does not find a case you know exists (or if you want to update the stored version), it will then search PACER. You are responsible for any PACER charges, so at this point you must log in and provide your PACER account information (or provide a payment method if you do not have or prefer not to provide your PACER credentials). Search results show matching cases. Click on the docket you want to go to the menu for that case. If you wish to view a document from that case, click on it to see what the charge will be before you proceed. You also have the option of downloading all documents in a docket in bulk from PACER. A prompt will show you the total price before you proceed. Basic at $49 a month. Plus at $99 a month. Pro at $499 a month. These different levels offer a variety of different features, but a key one involves document retrieval. For any document already in Inforuptcy’s database, Plus and Pro subscribers can retrieve it at no cost. Free and Basic users retrieve it at 50% off what PACER would charge. If Inforuptcy does not already have the document, you will incur standard PACER charges to retrieve it. However, once you have retrieved a document, Inforuptcy saves it for you, so you are never charged for it again. Everything you do on Inforuptcy is stored in case folders. If you download a document, for example, Inforuptcy creates a folder for that case and stores the docket and document. Later, when you want to return to a case, start with the case folder rather than begin a new search. Within a case folder, you can set up docket alerts to automatically monitor for and alert you of new case information. You can set the frequency and Inforuptcy will check PACER and alert you of any updates. You can also load your own documents into a case folder. Folders allow for collaboration, so you can invite others to share a folder and discuss the case in a comments section. Different pricing levels enable different functionality within these case folders. The basic level stores case information but does not allow sharing or document uploads. Inforuptcy offers free management of ECF one-look documents. Attorneys who participate in the federal courts’ ECF system receive one free electronic copy of all documents filed by other parties. You can set up Inforuptcy so that it will automatically store and organize these emails. These emails can be shared with others in your firm through the Case Folders feature. Another feature of Inforuptcy is the marketplace for selling and buying bankruptcy assets. According to Inforuptcy, this is the only national marketplace that compiles and lists assets being sold through Section 363 sales of standalone assets. Inforuptcy obtains the 363 motions and then inputs the asset and seller information. It also allows direct listing of assets for sale by trustees, debtors-in-possession, attorneys and others. Inforuptcy tracks Chapter 11 filings and also aggregates bankruptcy news from a variety of sources. When you are on the search page, a list in the left-hand menu lets you browse Chapter 11 filings by date. A News tab at the top of every page lets you see recent news stories and blog posts. These can be filtered by category, source and date. Inforuptcy lacks some features of other PACER search tools but includes some that the others lack. For example, it does not provide real-time universal search of PACER dockets, as PacerPro does. Rather, as noted above, Inforuptcy first searches its own database. If you do not find what you want there, you are directed to PACER Search. PACER’s national search is updated only once a day and includes only selected information. For now, the biggest differentiator for Inforuptcy is its pinpoint focus on bankruptcy. It provides bankruptcy dockets, alerts, news and a marketplace, making it a one-stop shop for bankruptcy professionals to manage and monitor cases. Meanwhile, as it gears up to expand its scope to all PACER dockets, we will stay tuned to see how it develops.